In 1855, the University of Iowa became the first public university in the country to admit women and men on an equal basis. To this day, the will to break down walls and challenge ideas continues to define what it means to be a Hawkeye. The University of Iowa provides an engaging interdisciplinary learning environment that encourages exploration, critical thinking, and creativity. Expert faculty members work directly alongside undergraduates on projects and research, helping Hawkeyes get involved and gain crucial, hands-on skills in their desired fields. 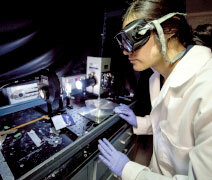 Iowa’s led the way in numerous areas of scientific inquiry, even creating some entirely new areas of study. Legendary space scientist James Van Allen, an essential contributor to the NASA Explorer missions, was the director of Iowa’s Physics and Astronomy program for more than 30 years. His instruments led to the discovery of the eponymous Van Allen radiation belts that surround planetary bodies. His contributions to the then-emerging science of space exploration helped establish the US as a leader in the field, simultaneously beginning Iowa’s continuing heritage of leadership in astrophysics. 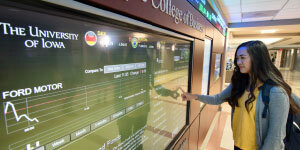 Van Allen is only one example of the incredible possibilities of research at Iowa. From advanced technologies and medical treatments to practical solutions for everyday problems, Iowa’s expert faculty are consistently applying themselves to pushing the boundaries of what’s possible. But it’s undergraduate involvement that makes Iowa such a unique research institution. In fact, Van Allen himself was known for keeping an open-door policy, finding a role for anyone, regardless of major, interested in contributing to the department’s research. Today, nearly one in three undergraduates at Iowa are involved in hands-on research projects, developing unique skills and gaining direct experience in their fields of interest. Many schools use a competitive approach to motivate their STEM students, pitting peer against peer in a scramble for the top of the class. This isn’t the case at Iowa. Hawkeyes are encouraged to work together and focus their energy on bringing new ideas to life through teamwork, not trying to outpace one another. Hawkeye ingenuity is supported by access to world-class technology and facilities that are among the most sophisticated on the planet. From student-run fabrication shops to one-of-a-kind VR simulators, everything students need to explore something new is at their fingertips. But the best resource available to Iowa students is always their fellow Hawkeyes. 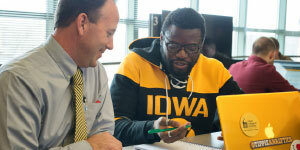 Iowa strives to remove the barriers between areas of study, allowing students to make connections and bring different perspectives together, even combine their own interests in a unique way. Engineering students, for example, each complete an artistic/creative elective as part of their course of study. They might even choose to work alongside Design students in interdisciplinary courses, like one in which students draft and fabricate their own bicycle. This focus on academic flexibility and cross-disciplinary study opens up a wide array of unique opportunities at Iowa. By the time they graduate, Hawkeyes have both well-honed creative skills and a knack for teamwork that sets them apart in today’s competitive job market.